It’s the world’s third-largest economy, and yet most stories covering Japan focus on the problems it’s facing: an ageing workforce, falling GDP, lost decades. Take this piece from Bloomberg , which asks “What’s wrong with Japan’s economy?” Anyone not familiar with the country would think it was falling apart. Of course, Japan has its fair share of challenges, but as these charts show, that’s just one side of the story. Unless you’ve been living under a rock for the past year – and therefore missed the post-Brexit fallout, growing anti-globalization backlash, and rise of certain populist leaders – you’ll know that the topic of inequality has been making headlines from Europe to the US. In Japan, it’s a slightly different story. Of course, income inequality exists. But according to data from the World Wealth and Income Database , a project led by economist Thomas Piketty, the gap between rich and poor in Japan is not growing quite so fast as in other developed nations. 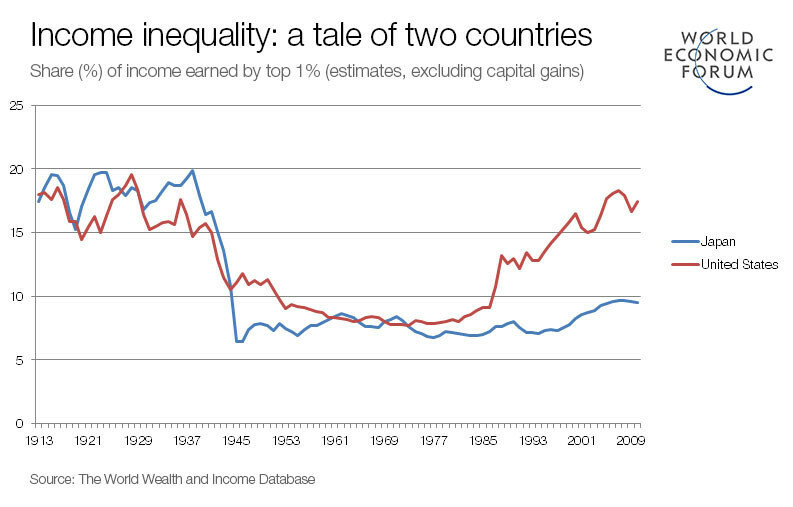 So what’s behind this trend in income inequality? In part, it’s because Japanese executives don’t pay themselves an over-inflated salary. “Japan is generally a country with low pre-tax income inequality because pay, and especially executive pay, is very regulated through company norms and seniority pay scales,” Emmanuel Saez, an economist, told the Wall Street Journal . 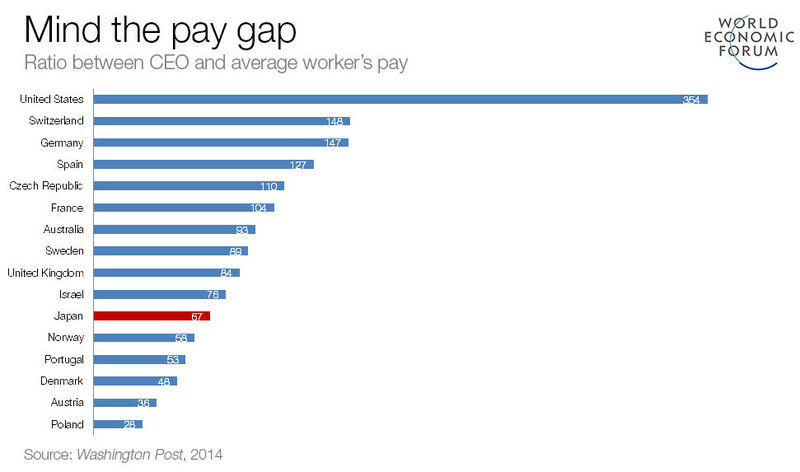 In fact, when it comes to the difference between average CEO and worker pay, Japan has one of the smallest gaps: the salary of your average Japanese CEO is just 67 times bigger than the pay cheques their workers receive. If that sounds like a lot, compare that with the US, where the figure stands at a whopping 354. If Japan’s approach to executive pay seems progressive, the same hasn’t always been the case for gender equality. In the past, cultural norms dictated that once married, women – or “birth-giving machines”, as a former Japanese health minister called them – should stay at home and raise a family. And for years, that’s what they did, which was a huge drag on economic growth. But slowly, things have been changing. 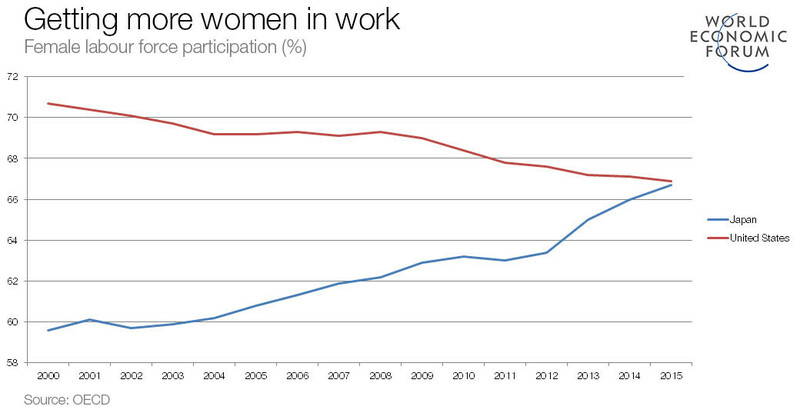 Today, Japan’s female participation rate in the labour force is not far off that of the US, which has actually been falling. Getting more women to work was a key part of Prime Minister Shinzo Abe’s plan for economic reform – and it seems to be paying off. While in recent years all eyes have been on Silicon Valley and US-born innovations (and not without good reason), you’d be foolish to write off Japan. The country that gave us bullet trains, CD players and emoji is still one of the most innovative in the world. 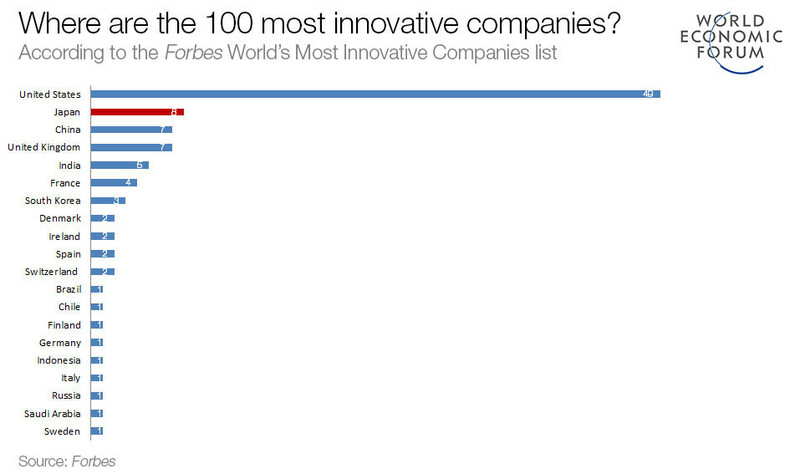 According to research from Forbes , Japan is home to just under 10% of the world’s 100 most innovative companies. That puts it in second place, behind the US, and ahead of faster-growing countries like China and India. This last chart shows that in spite of some of the negative news stories about Japan, most Americans have a favourable view of the country and its people. 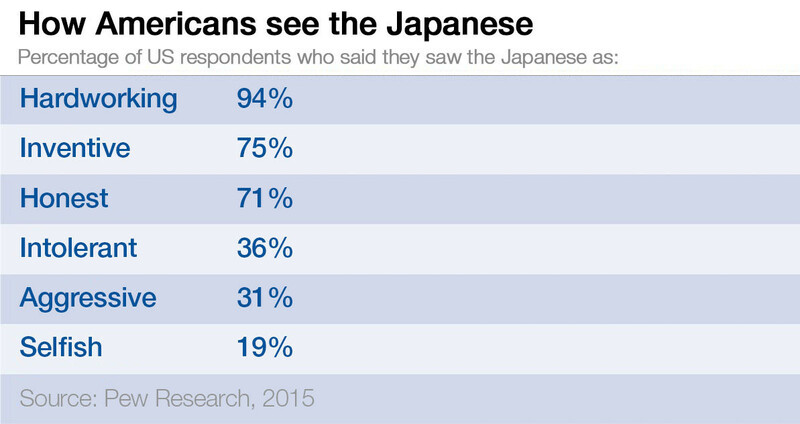 To mark the 70-year anniversary of the end of World War II, Pew Research asked respondents in the US to rate the Japanese on a range of characteristics. The results were overwhelmingly positive.